"Every wall, every gate, every street has their signs of war in Grozny." Like hundreds of other members of the Virtual Grozny Russian-language forum, Natasha Raslambekova lived in Chechnya's capital until the war forced her to flee in the spring of 1995. This past September, nearly 12 years after the First Chechen War began, Natasha posted 28 pages of her wartime diaries, describing the horrible experiences of that time, sharing her powerful memories with those who could relate directly to what she wrote: some of her readers lived through the horror themselves, others had been lucky to escape before the war broke out - and all are still grieving the lives lost, still mourning the destruction of their beloved city. Natasha's diaries revive what has been forgotten by outsiders: the dreadful events, which, over the years, have been overshadowed by numerous others, no less dreadful. As life in Grozny seems to be slowly patching back together, voices and images from the past - of people trapped inside hell - are rescued from oblivion and presented with the raw immediacy typical of today's blogs. Natasha's readers at Virtual Grozny express their gratitude, and admit to having been shocked and moved to tears by what she wrote. Natasha is 38 and lives in France with her family now. Below are a few excerpts from her diaries, translated from Russian. The first entry is dated November 26, 1994, Natasha's birthday; the rest are undated. The original document can be downloaded here or here. The war has started today, fighter planes are flying over, dropping bombs. The battle is raging in the city's center. Opposition troops and tanks have entered the city from three directions, tanks can't maneuver in the city streets and are being shot down from the roofs of the buildings. Lots of ruined buildings in the center, tanks are burning. Lots of dead and burnt people, human remains lie on the asphalt, on the burned-down machines, hang on trees. There's a non-stop humming noise coming from the city, explosions and booming are heard. Our neighborhood isn't in the center, and that's why all the people are out in the street, watching what's going on in the center. People are sharing every piece of news with each other, in whisper, they are looking at the glow of the fires and listening to the booming of weapons. People try to keep together. It's really impossible to stay inside the apartment, there's a pressing need to be outside, with the people. Today is my birthday. From all those who were invited, only my husband's parents came (from the other part of the building), and my father. We didn't manage to have a party, of course. The few toasts we made were for this nightmare to be over soon. Electricity is off. It got dark, but the people stayed in the streets all the same, scared to return to their unlit apartments. My father-in-law stretched a cable directly to the light pole outside and there was light in our two apartments. All the neighbors were at our place. We watched the news, listened to the radio, and everyone left late at night, when the battle in the center quieted down a bit. The sky over the center is all red from fires. There's panic in my parents' home, mama with our son and nephews is hiding in the cellar, she is very scared, her blood pressure has risen. 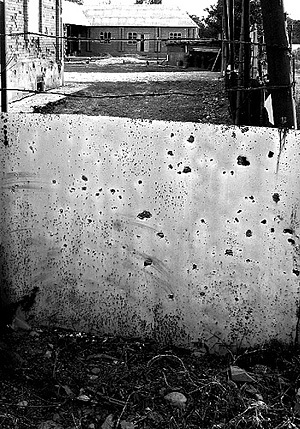 The fence of the parents' house bears marks of the air bombs' shrapnel. My husband collected the fragments and brought them home. All the residents of our building kept stopping by to look at them, and then we visited one another till late at night to share the latest news. No one locks the doors to their apartments. People want to be together. There are fewer and fewer people left. They are leaving somewhere and not coming back. Everyone is talking about some corridor, which has been opened till Dec. 10, but no one knows where it is and what would happen after Dec. 10. We are being bombed and shot at every day and every night. Men aren't simply going down to the cellar - they are running there with curses. And street dogs run ahead of the people and then sit with us in the cellar, close to our feet, until the battle is over. Electricity has been out for a week now. Almost every day, the fighting is so fierce that we jump out of the cellar only to grab some food and water, and then run back. I'm always hungry, for some reason. Our daughter is such a [good girl]: she doesn't panic, doesn't scream, just sits leaning close to me and my husband, and asks questions sometimes, and then we reply to her that it's a kind of a game. From the two buildings in our yard, only 14 families out of 56 are still here. The rest have left. At all times, we stay dressed inside the apartment, and our warm clothes lie on the table in the hallway. We've taught our little girl to run and dress herself in case bombing starts. Every second is precious, and that's why everyone gets dressed on his own, and by the time my husband and I are putting on our jackets, our dear daughter has already managed to put on her coat, at least. It takes us 10-15 seconds to get dressed up for this sitting around in the cellar. There's no more water in the cellar and now we draw some from the fire pool in the schoolyard. School #54 is next to our house. The water there is dirty, with trash and pieces of wood in it. We sift it through, let it stand for a while, then boil and drink it only after that. Today two rebels came up to the pool and asked for something to drink. They were given and they drank right out of the pails. A man from the house next door was killed overnight. My husband used to know him and went to bury him. They buried him next to the house, on the flower bed. One shouldn't walk too far away - everything is being shot through. The school building got hit a few times during the battle. We went to look. People were dragging all they could - desks, chairs, curtains... Two women and a young man were rolling the school piano. I admire this optimism: they are sure they'll need the piano in the future, which means they are sure they'll survive. Or, most likely, they have gone crazy. During the quiet time, our classmate stopped by, Shamil, an Ingush. He begged us to let our daughter go with him. He wants to take her and his parents out to Ingushetia to his relatives. He swore they'll look after her better than after their own children. Everyone's talking about the upcoming storming of the city. I can't leave because my father is here and I won't let him alone. I cried all night, while packing my daughter in the candlelight. I was preparing her for departure. Shamil will pick her up early in the morning. God, what's going on with us! I don't know where my mother and my son are. Whether they are alive. And now I have to send my daughter to where I don't know anyone. But I have to do it. Shamil will take her away early in the morning. Shamil didn't show up. He just didn't manage to get to us. At 4 AM, a battle started, so fierce it was impossible to step out into the street. We were crawling to the cellar. We sat in the cellar from 4 in the morning to 2 in the afternoon. There are no cigarettes, so we are rolling our own, from newspapers and [old tobacco]. Today is the New Year's. It's my favorite holiday. On the radio, they are talking about a truce for the duration of the holidays. We had a calm day, but far away, there was a battle. I was cooking a "holiday dinner" from the remains of the food. The battle began here around 9 PM, too, and lasted till 5 in the morning. It was so violent, everyone in the cellar prayed. Old men who had survived World War II were saying that it wasn't as scary then as it is in this war. There were several volleys a minute. We spent the New Year's in the cellar, praying. January 1. No gas. We've all made brick ovens outside. Our neighbors' oven has a good pipe [...]. Ours is bad and the smoke flies in all directions. We don't know how to lay ovens. The rooms have turned cold and dump at once. I'm freezing all the time. We finished the soup today and found shrapnel at the bottom of the pot. When I was cooking it, a battle began, and I ran to the cellar without covering the pot, and they fell in there. These fragments didn't have the deadly power anymore, as they failed to break through the pot's bottom. I keep asking papa not to go to work, but he keeps insisting on riding his bike there. He works as a master at the City Gas. "Please understand, daughter," he says, "if I don't go, who will give gas to the people?" Papa can't live without work, he feels he owes it to the people, and three blocks from father's place, the wounded gas pipes [lack holes], because each little hole is filled with a neat wooden stick. This is how my papa cures the pipes, so that the people at least had gas. They killed a stray cow at the school stadium and were selling the meat cheaply. We bought as much as we could on the money we had. In the afternoon, the daughter was playing by the oven. There were shots. I asked her: "Laura, why don't you run to get dressed and go down to the cellar?" She replied: "Because I know that they aren't shooting to us, but from us." She can now determine by the sound where to and where from bullets and shells are flying. Then the morning arrived. In the train station building, the migration service opened and we were registered and given tickets to Moscow. Church representatives were giving tea to the people, sandwiches and the New Testaments. At the migration service, in addition to our tickets, we were also given [slips of paper that could be exchanged] for food at the small train station cafe. We took sausage, sandwiches, an apple for my daughter, a little bit of cheese. All this we haven't seen in a few months already. We stood at the platform, waiting for our train. And suddenly a civilian plane flew over the platform - there's an airport in Minvody, close to the train station - and more than half of the people on the platform fell to the ground. "These are Grozny natives," I thought.